I managed to wake early today and was up, dressed and out of the château by 8:30am. 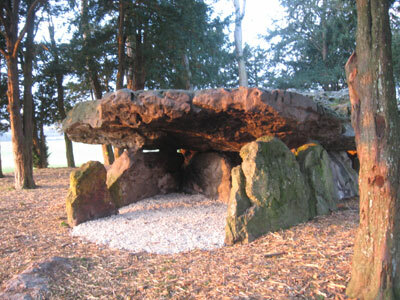 My objective was to visit the dolmen (la grotte aux fees) just down the road. The temperature was freezing until the wind hit me and then it was too cold to notice how cold it was. My head turned blue and I lost three toes but I was determined to reach the ancient monument. And boy, was it worth it. 4,000 years old and resembling Fred Flintstone’s house. It stands within a grove of yew trees which stand within a big empty field. Visitors to the dolmen can wander all around, over and through it. Rumour has it that it wasn’t actually used for anyone’s burial. The stones on the top weigh around 80 tons each! Given I can guess how they built the thing, I have no idea how they actually moved the stones to the location. When the sun peaked over the horizon, the rays of light streaked across the field and straight into the entrance. It was a very magical moment. I stood in the entrance and felt the weak warmth as I turned to walk back. Today we toured Tours and it was a seriously adventure-some day. The excitement was so great that I find it difficult to type even in retrospect. It all started normal enough. We warmed the car up; we drove down the usual roads and through the thousands of roundabouts; we finally found Tours. It was a close call as we were looking for the Wilson Bridge but ended up on the Mirabeau which wasn’t on our map. Gosh! We parked in the wonderfully wide Boulevard Heurteloup then started walking down the gravelled centre towards the station. There appeared to be no shops open so we wandered into a small boutique-y tea shop for a morning coffee and brioche. A warm hearted madame, who vaguely resembled Mrs Bale, enthusiastically served us – I was forced to have an espresso with a strength of 9! This kept me awake for the rest of the day. And probably explains my subsequent problems sleeping for the rest of the holiday. We then continued up the road and into the Musee de beaux artes. Outside stands a massive 200 year old cedar of Lebanon. It is wider than it is tall, or so my translation of the plaque goes. The gallery is housed in what was once the archbishop’s palace, right next to the cathedral, and owns some wonderful paintings. Most famous is Rembrandt’s Flight into Egypt which shows the beginning of his own chiaroscuro style which sustained him for the rest of his career. Though quite small, the image is haunting, the light coming from behind the figures of Joseph, Mary & baby Jesus as they seem to be peering into the blackness before them. The mule is exceptional as well. But, apart from the Rembrandt, the gallery owns not one but two St Sebastiens! Sadly, one of them was not on display so I was forced to buy the postcard. Fortunately, the other one was. St Seb looked a bit green, as you’d expect him to be having just been completely spiked with arrows. It was painted by Eustache Le Sueur in 1654 and shows a bunch of holy women pulling the arrows out. I think he was taking a bit of artistic licence with this as it was Saint Irene who removed them all and nursed him back to life. Still, it creates a nice balanced painting. 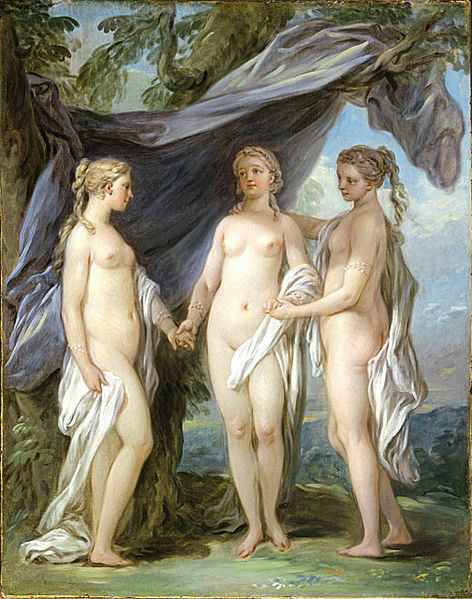 Of great interest was another painting of The Three Graces by another van Loo. This time it was Charles-Andre (AKA Carle) (1705 – 1765). He was the brother of Jean-Baptiste who painted the one at Chenonceau. It was an almost identical pose but three different women. They did study together in Rome so maybe it was one of the compulsory projects. Interestingly, the guide book for the museum does not mention van Loo although there are four big, quite exquisite paintings by him along one wall. They are normal scenes but with adult-dressed children in them. Most odd. They sort of reminded me of the dogs playing poker paintings favoured by the Connor family. Sadly the top and lower floors were closed until the afternoon so we managed a few laps of the only floor that was open then went next door to the cathedral. 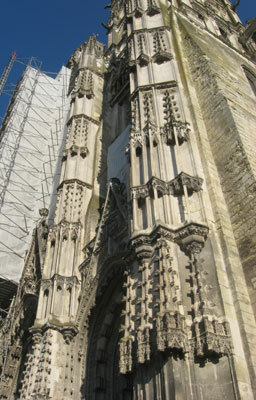 The spires of St Gatien reach heaven-ward with lace-like tentacles in a wonderfully Gothic style. Inside all is awash with the colours from the stained glass. It all looked truly magical. Unfortunately, although the guides were printed in about 15 languages, the only one that had run out was the English version. There are lots of lovely chapels throughout the cathedral. In one of them is the tomb of the sons of King Charles VIII and Anne de Bretagne (my regular readers will no doubt remember her from our previous trips to Brittany). One was 3 years and the other just 25 days. The tiny figures carved atop the sarcophagus are hauntingly life-like and a testimony to the skill of the sculptor – a student of the great Michel Colombe who’s statue stands in the garden opposite the cathedral. Co-incidentally. After a long visit, we all needed some sustenance so it was off to the Celtic Creperie next door, where we all enjoyed galettes with various fillings and a fine glass of Normandy cidre before heading back out into the freezing winds. We were strolling down to the Place Plumereau (or Place Plum as we started calling it), hoping to find some shops that were open but, sadly, we only passed closed doors. When we reached the Rue Nationale I stupidly noticed a Ferris wheel on the edge of the Loire and even stupidly-er suggested we ride on it. We told Bob we’d meet them there and he went off to collect Claire from a toy shop. 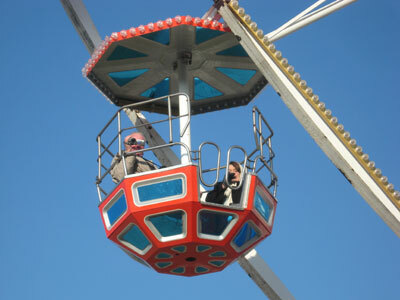 Now, Mirinda has a problem with heights so being sat in a seemingly flimsy, faintly rocking bucket, suspended over Tours, had her grasping the bars either side in white knuckle fear. At least for the first revolution. By the time we were on our second turn, the cold had frozen all her fear. At the top of the wheel, the wind chill was about -50 and blew all thoughts away. Worst still, the wheel stopped to let some passengers off. Then we went round and round about 8000 times, getting colder and colder each revolution. When Bob and Claire appeared at the bottom we were too cold to wave. It was the fear of our arms snapping off that caused the most concern. Then we stopped at the top again. I should mention the view, which was excellent, the day being so clear and all. The Loire looked lovely as did the towers of the cathedral. The reason we’d stopped was to let Bob and Claire (and a few other people) on at the bottom. By the time we reached the bottom, we were frozen solid and the guy had to use an oxyacetylene torch to get us out. Eventually we stood and laughed at Bob and Claire as they discovered just how cold it can get up there. It was certainly a sad day that Bob lost his hat! His ears (and his head) will never forgive him. Oh, the humanity! Still, I managed to get lots of great pictures. When Bob and Claire had finally been let off the torture device, we resumed our stroll down towards Place Plum. The old town was lovely; buildings with ornate carvings, street cafes overflowing with smokers outside, dogs under tables. It was so beguiling we were forced to participate in one of them. Truly French and engaging. We had a delightful coffee. Actually I had coffee. Mirinda had tea and Bob and Claire had hot chocolate. Having warmed up a bit, we once more headed outside into the freezing conditions to walk, gradually back to the car. Our mistake was splitting up. At an arcade somewhere in Tours, Mirinda and I slowly walked down the main street while Bob and Claire caught up with us. Then calamity struck. We couldn’t find them. Based on nothing but mistaken intuition, Mirinda was sure Bob had heard ‘left’ when she said ‘right’ and dispatched me up the overcrowded, bustling footpath in the opposite direction. Honestly, it was impossible. There were enough people to fill fifteen football pitches AND a double decker bus. And most of them were moving very slowly and were taller than me. I walked the entire length of the street but no Bob and Claire. On the way back my phone rang. My fingers were numb. When I opened my phone, I instantly hung up on Mirinda. When I tried calling her back, nothing happened. I assumed she’d found her wayward parents and quickly retraced my steps. There was Bob, in the middle of the road, waving at me. Claire was waiting about 8 miles down the road. Apparently, they had left the arcade deep in the centre of a huddle of mad French shoppers, anxious to slip by us. And they were very successful. By the time we caught up with Claire she’d been propositioned by a French guy who, she claimed, specialised in kidnapping older women. With a great sense of relief we walked back to the car and drove back to the château. 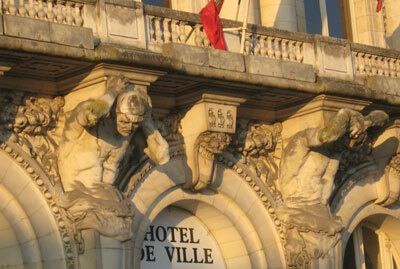 We did manage to admire the Tours Hotel de Ville on the way which had these amazing sculptures holding up the front of the building. You’d think the excitement was over for one day but you’d be wrong! Just as we arrived, Mirinda suggested walking over to the dolmen. Claire laughed with derision but Bob and I replaced our warm clothes and set off with her, across the frozen wastes. Of course the sun had gone down and we were bathed in nothing but grey twilight as we trudged beside the road. We spent a short time inspecting the massive stones and wondered about how it all came about then headed back. Mirinda’s expert opinion was that the entire thing was created by aliens. Walking along the road tested Mirinda’s patience a bit too much and we were soon walking across a freshly ploughed field towards the back of the château. When we reached the end of the field we were presented with an electric fence, barring our way forward with an irritating ‘zzzzt’ every few seconds. We walked along a small gully, peering into the gloom to determine the extent of the fence. Eventually, Bob grabbed a stick and forced down the top strand so we could step over. As we reached the safety of the château grounds we expected big lights to come on and the guards to start shooting from their towers. Perhaps surprisingly, this did not happen and we safely entered the lodge to find a warm and snuggled up Claire asking if the room was warm enough. Ah, I forgot Bob’s new hat! So cold was his head on the Ferris wheel, that he went into the first hat shop we saw – actually it was the second as the first was closed – and bought a new one for his poor head! This entry was posted in Gary's Posts, Loire 2009. Bookmark the permalink.